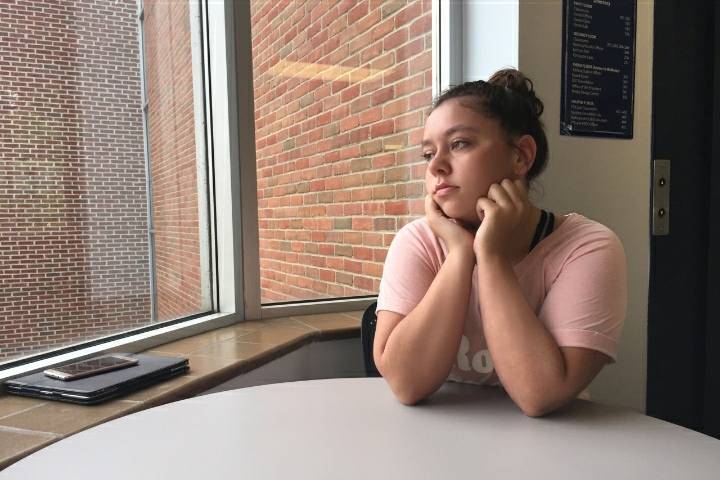 Editor’s note: The following profile was written by 10-year-old Harper Creek Middle School student Ellah Pace as part of Kellogg Community College’s Journalism and News Writing Camp, running July 23 through 26 on the College’s North Avenue campus in Battle Creek. Pace also shot the above portrait of her profile subject Taylor Groth during the camp. Taylor Groth’s dog had a big accident. It was a rainy day and her brother Cameron, 13, who goes to Calhoun Christian School just like his 15-year-old sister, was throwing the ball to Bella, their dog with black and white spots. Bella, a female, is very wild when catching the ball. Cameron threw the ball and Bella hit her leg on a little trailer. Bella sat by the trailer squealing super loud. It was more like a scream, Groth said. Bella was hurt so bad that a bone was sticking out of her leg and she had to stay overnight at the vet. “My grandma and I were waiting in the waiting room for six hours,” Groth said. Bella had surgery on July 23. Groth said she will probably go to college to be a forensic anthropologist. A forensic anthropologist is somebody who studies bones. “I have a lot of backup plans for who I want to be when I grow up,” Groth said. One of her backup plans is to go to tech school and become a electrician. Another is to go to medical school and become a nurse.